Kunio Watanabe, Song of the White Orchid, 1939, 35 mm, black-and-white, sound, 102 minutes. Kazuo Hasegawa and Shirley Yamaguchi. IN THE LIFE OF SHIRLEY YAMAGUCHI, who died in the fall of last year at age ninety-four, the entire twentieth-century history of the Pacific Rim is reflected. An actress, songbird, and legislator who lived and worked in Manchuria, Tokyo, Los Angeles, and Hong Kong, Yamaguchi is one of the subjects of a Japan Society film series timed to commemorate the seventieth anniversary of the end of World War II. “The Most Beautiful: The War Films of Shirley Yamaguchi & Setsuko Hara” is somewhat deceptively named—the nine-feature program focuses on female stars, and so none of the movies are dispatches from the front lines, exactly. Most take place far from the battlefield, and four were released after the surrender of the Empire of Japan. In another respect, however, the marks of the war are all over these films: Japanese imperialism, the reverberations of combat on the home front, and the confusion of new possibilities that followed defeat—new possibilities that Yamaguchi would seize upon in the course of a most remarkable career. Mansaku Itami and Arnold Fanck, The New Earth, 1937, 35 mm, black-and-white, sound, 114 minutes. 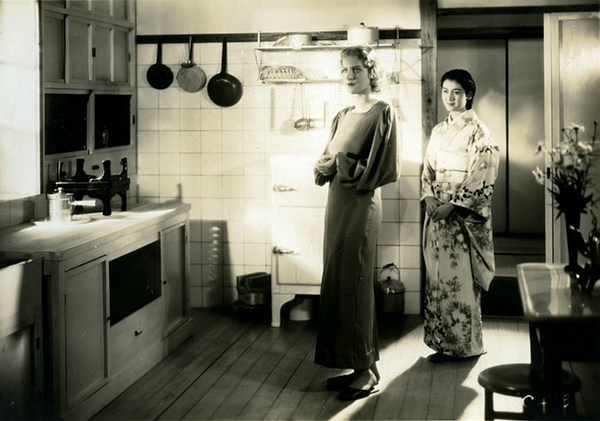 Ruth Eweler and Setsuko Hara. Yamaguchi was born in northeast China in the years of increasing Japanese influence in the area preceding to the 1931 invasion that created the puppet state of Manchukuo, and was raised in the mainland speaking what I am told is flawless Mandarin. This, along with other obvious assets—she had a lovely, tremulous soprano singing voice and photographed strikingly, with large eyes and a prim bow of a mouth—brought her to the attention of Manchuria Film Production, a Japanese company half owned by the South Manchuria Railway, of which her father, Fumio Yamaguchi, was a sometimes-employee. Billed as Li Xianglan and playing a native Chinese, Yamaguchi appeared in the so-called Continental Trilogy films opposite Kazuo Hasegawa. These movies explicitly endorsed the philosophy behind Japan’s pan-Asian ambitions, gozoku kyowa, or “harmony of the five peoples” (Chinese, Koreans, Manchus, Mongols, and Japanese), a doctrine raised to the level of utopian cult by Fumio Yamaguchi, among others. Two of these films, Song of the White Orchid (1939) and China Nights (1940), play Japan Society, and follow approximately the same narrative arc: Stubbornly nationalistic Chinese Xianglan/Yamaguchi is at odds with Japanese Hasegawa, but gradually comes to appreciate the benevolence of his intentions, and prostrate herself before him. The Chinese people were not so grateful for the lesson they were being taught by Manchuria Film Production and Yamaguchi—“a Chinese manufactured by Japanese hands,” as she wrote in her 1987 autobiography. She was imprisoned for nine months and sentenced to death by Chinese Nationalists, only saved when proof of her Japanese origins was smuggled into the country inside a doll. The judge presiding over her case called her “a Chinese impostor who used her outstanding beauty to make films that humiliated China and compromised Chinese dignity,” which is something like the ultimate in backhand compliments. Returned to a foreign homeland, Yamaguchi began the first of the reinventions which would mark her career, traveling between national film industries with an ease unmatched by any Asian actress of her era. Japan Society has Yamaguchi’s best-known Japanese and American efforts, Akira Kurosawa’s Scandal (1950) and House of Bamboo, in both of which she plays a woman scorned—a classical singer smeared by the tabloid press for romantic indiscretions for Kurosawa, a Japanese detested by her own people for shacking up with a gaijin for Fuller. Playing Chinese, Japanese, even an aboriginal Taiwanese in 1943’s Bell of Sayon, Yamaguchi might’ve created the mold for the multiplatform pan-Asian pop star, a torch later carried by Taiwanese Teresa Teng, who covered Yamaguchi’s “Hen Bu Xiang Feng Wei Jia Shi” (If Only We Had Met Before I Married). None of this was quite enough to warrant Yamaguchi’s inclusion in the Oscar death montage, but Japan Society has given a much greater tribute to this remarkable, complicated career. 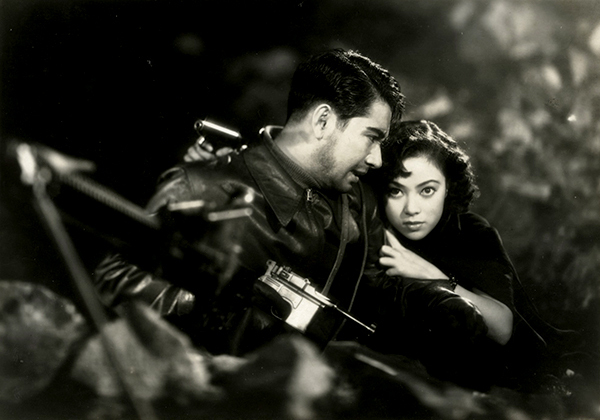 “The Most Beautiful: The War Films of Shirley Yamaguchi & Setsuko Hara” runs March 21–April 4 at the Japan Society in New York.